Photo Courtesy of ASC Sports Information Desk: Kaimyn Pruitt shoots a free throw. INDIANAPOLIS – For the second straight year the Adams State men’s basketball team has made the field of 64 teams for the NCAA Division II Men’s Basketball Tournament, where the No. 7 seed Grizzlies will face Rocky Mountain Athletic Conference (RMAC) foe and No. 2 seed Metro State on Saturday, March 10, at 2:30 p.m. in Golden, Colo. The Grizzlies’ entry into the NCAA Division Tournament is their third in program history and second in as many season under head coach Louis Wilson. The Grizzlies will enter the Central Region, which will be hosted by top-seeded Colorado Mines at Lockridge Arena, with an overall record of 19-8 this season, one win shy of their program record of 20 wins, set last season. ASC and Metro State are joined by just one other RMAC squad in No. 1 seed and Central Region host Colorado Mines, while five Northern Sun (NSIC) squads will make their way to Golden for the tournament. The Roadrunners will enter the NCAA DII Tournament with a mark of 22-6 overall. Like the Grizzlies, Metro State bowed out of the RMAC Shootout in the quarterfinal, where they were also the second seed but fell to the conference’s seventh seeded Colorado Mesa in the first round. Metro State was ranked 12th in the latest edition of the National Association of Basketball Coaches (NABC) Division II poll, released on Feb. 28. Metro State scored a 52-51 win over Adams State in Denver this season on Jan. 21, though ASC is 1-1 against the Roadrunners under Wilson. The Grizzlies, 2-0 this season in neutral site contests, last scored a victory in Golden on Dec. 17, 2005, topping CSM 60-55. The Orediggers, ranked No. 2 in the nation and owning a 27-2 mark this season, will host No. 8 seed and NSIC member Augustana (S.D. ), 17-10 this season, in the opening round on Saturday. The Orediggers claimed their first ever RMAC Shootout title on Saturday to go along with their regular season league crown. 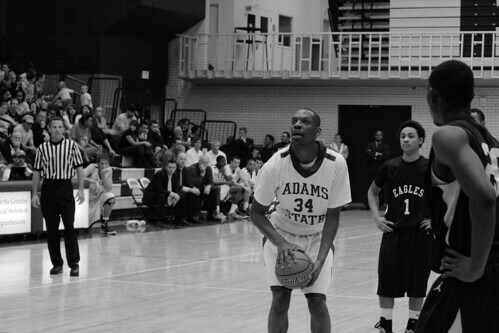 CSM has not lost since Adams State scored a 70-59 win over the then 9th-rakned Orediggers on Jan. 13 at Plachy Hall. The Vikings fell in the first round of the NSIC Tournament on Wednesday. Other first round match-ups will include No. 3 seed Bemidji (Minn.) State, 22-8 this season, against No. 6 seed St. Cloud (Minn.) State, which will enter with a record of 19-8. The final first round match-up will pit No. 4 seed and NSIC Tournament Champion Southwest Minnesota State (18-10) against No. 5 seed Minnesota State Moorhead (20-8). The winner of the Grizzlies-Roadrunners match-up will face the victor in Saturday’s Bemidji State-St. Cloud State match-up in one Central Region semifinal, while the winners of the Colorado Mines-Augustana and Southwest Minnesota State-Minnesota State Moorhead will face in the other. Semifinal games will be played on Sunday, March 11, and the Central Region Championship will take place on Tuesday, March 13. Winners of each of Division II’s eight regional tournaments will advance to the Elite Eight, taking place from March 21-24 at the Bank of Kentucky Center in Highland Heights, Ky.